Thank you techradar.com for the information for this post. The excitement of the rumor mill, the titillation of every leaked photo led to higher than ever levels of expectation for the iPhone 5, and while the announcement was greeted with some derision at the lack of perceived headline improvements, the record sales tell an entirely different story. Given the underwhelming changes to the iPhone 4S, the iPhone 5 really needed to re-energize customers to prove Apple can repeat the game-changing trick it managed with the iPhone 4. We'll begin in the traditional manner: how the thing actually feels in the hand. With the iPhone 5 there were many types of prospective buyers: the upgrader from the 4 (or more-money-than-sense iPhone 4S upgraders), those tired of their Android handset and those taking their first steps in the smartphone market and want to get one of them iThingies their friends has. It's an odd sensation, but it actually detracts from the experience when you first pick it up. We've praised the weighty feel of the iPhone in the past, lending it a premium feel in the face of toy-like phones, and it's almost disappointing that Apple decided to join that clan. However, through extended use this problem quickly disappears, as the overall effect of the phone is still a chassis designed for strength, it just sits more anonymously in the pocket. 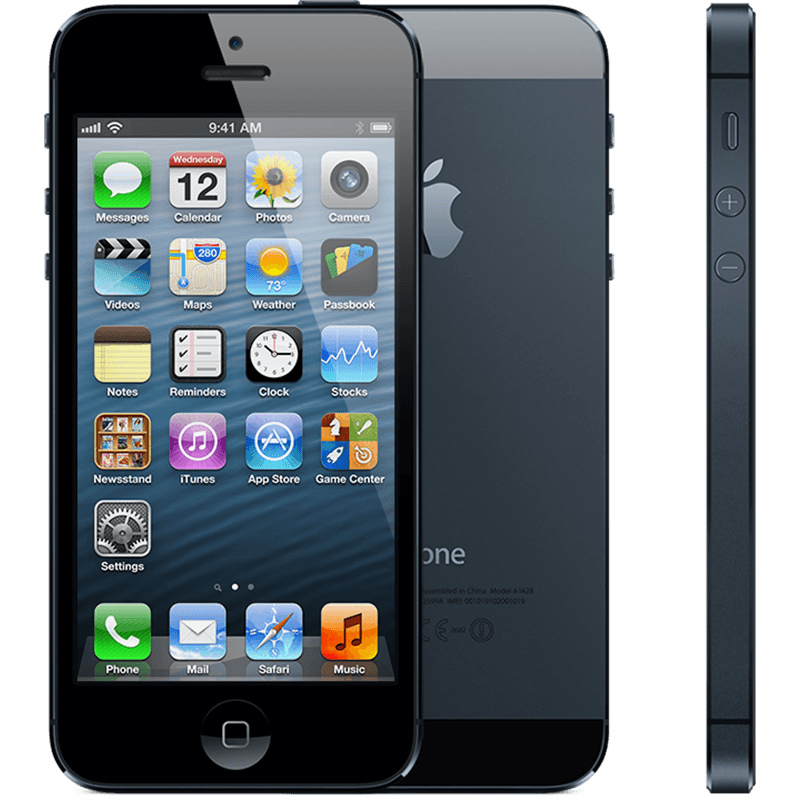 You'll obviously see the change in height, too – the iPhone 5 stands 4.87-inches tall to allow for the larger 4-inch screen. In truth, those not familiar with the iPhone 4S probably wouldn't notice the difference, which is why it's a good move from Apple to include the larger screen if it's not going put people off that hate larger phones. The decision to stick at 4-inches is Apple's admission that while it recognizes people are all over the idea of having more screen real estate to play with it doesn't want to move away from the thumb-friendly nature of the device. Through a mixture of moving the centre of gravity slightly as well as repositioning the screen within the bezel, it's still possible to scroll your thumb mostly around the whole display one-handed, which Apple is clearly keen to keep hold of. However, we're not convinced of that argument any more, and the power button was still a little out of reach when using the phone normally, as was anything in the top left-hand corner of the screen. This was no issue in reality, as scooting the phone down a bit in the palm is a natural action. But if that's the case, then why not offer a 4.3-inch screen at least? There's more to a phone than a screen these days (although increasingly less and less) and the general construction of the iPhone 5 is excellent to say the least. We've tested both the ceramic white version and the anodized black, and the two-tone effect on the back of the phone is stunning, both visually and under the finger. The two sections of pigmented glass at the top and the bottom of the phone add a pleasant effect, and the sapphire glass is meant to be thoroughly durable, to complement the Gorilla Glass on the front. Apple knows consumers get furious when they drop an iPhone, and is clearly seeking to stop the smashes before they happen with a tougher exterior - although it seems the anodized black version is more prone to scratching, which means, sadly, you'll have to think about getting a cover for that beautiful frame. The same industrial band around the outside is in effect again as on the iPhone 4 and 4S, with small sections removed where the antenna joins. Apple has gone for a more advanced form of antenna here, meaning the days of lost signal are gone, and generally increasing the power of your call connection and GPS lock on, too. zYou can buy an adaptor, but it's going to be pricey: $30 when it lands in October. And unless you want to keep it permanently attached to the bottom of your iPhone 5 you'll need to buy a few, which is far from ideal. However, let's not harangue Apple too much for this: a smaller connector is not only easier to use (you can plug the smaller cable in either way round, and the connection feels more solid), but you're rewarded with a thinner and more compact phone to boot. The decision to move the 3.5millimeter headphone jack to the bottom is an odd one, as while it allows you to slip the phone into the pocket head-first when listening to music, which is a more natural action, it's a real pain in the posterior for some apps that will only work in landscape a certain way up. Using it this way means your headphones experience will be one of having to jiggle the jack around two fingers. It's not the most comfortable way to hold a phone, and even when using the phone in portrait mode, the jack gets in the way somewhat. There are other smaller design changes to the iPhone 5 too, such as the iSight front-facing camera moving to the middle and the home button being noticeably more robust to help reduce instances of a broken portal to your home screen. But enough about what the phone looks like - the killer question is how the thing feels in hand. We'll sum it up by saying this: smooth. It's a little slippery, and we were always worried we would drop the darn thing. But that's the only negative thing about the design (apart from the low weight initially) as it sits in the palm nicely and allows you to do it all with one hand, including hitting the top-mounted power/lock button with ease. That lock button is actually still loose, as it was on the iPhone 4S, meaning when you shake the phone around you can hear it clicking away, which undoes a lot of the premium feel Apple is going for. Make no mistake, the iPhone 5 is one of the most beautifully crafted phones out there - but when you're paying $199 up front for the thing, we'd hope this would be the very minimum Apple would do. And while it looks nice, from the front it doesn't really add much to the design of the iPhone - it's certainly not the same as the jaw-dropping design of the iPhone 4 compared to the 3GS... it's just another evolution in the iLine. It's not bad, but for those that hoped the iPhone 5 would be another big change there's a good chance they'll be disappointed about the look... until they feel the lovely back. There was a real chance here for Apple: remove the bezel and give the front of the screen a look that's similar to the OLED TVs from the likes of Samsung or LG… but instead we're treated to the same lines as before. You always get the feeling that Apple saves what it can for the next iteration of the iPhone, and while there's nothing wrong with the current construction we can see the edge-to-edge screen becoming something amazing on the iPhone 6.